Capturing the Cape’s fun and creativity by offering a hand-picked collection of unique, well designed gifts. 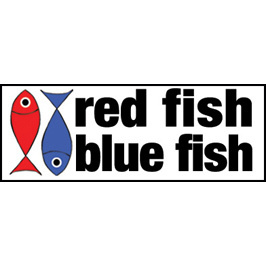 If you haven’t been to Red Fish Blue Fish yet, what are you waiting for? This fun little gift shop has just what you need for that hard to buy for person or even yourself. Owner, Jane Walsh, opened in 1993 as a way to feature local artists and craftspeople. Since then it has grown to feature hand made items from the U.S. as well as the world. Take your time to browse through this great collection of cards, eco-friendly gifts and jewelry. Red Fish Blue Fish carries gorgeous Real Native American Jewelry made in the U.S.A. Also, make sure to check out the Butterfly Wing Jewelry. The butterflies come from tropical rain forests and are gathered by indigenous people only after dying naturally and are then set in sterling silver in the U.S. Red Fish Blue Fish is open daily and year round. Jane Walsh opened Red Fish Blue Fish at 374 Main Street on December 3, 1993 as a way to feature works by local artists and as a working glass studio to sell her handmade blown glass jewelry. Jane grew up in Centerville and spent her teen years working for merchants on Main Street in Hyannis. She always liked Main Street’s creative energy and vibe created by the independently owned businesses and eventually decided to buy a house and start a business of her own here. A unique feature of Red fish blue Fish is the glass bead making studio in the front window where Jane forms glass to make beads for her jewelry designs. From the beginning she’s featured local artists whose work brings a really special element of Cape Cod to the shop. Over the years Red Fish Blue Fish has grown to include an eclectic mix of artful items from across the United States and around the world, including eco-friendly jewelry made from real butterfly wings and vintage Native American jewelry. Red Fish Blue Fish has been a favorite stop for visitors and locals over the past 20 years. Come see what tickles your fancy! Open 7 days 10-5:30 Monday through Friday And 11-5 on Sunday.